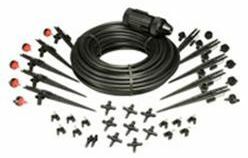 Rain Bird's Patio Plant Watering Kit is an easy and convenient way to get your plants watered and keep them looking healthy. Rain Birds Pation Plant Watering Kit helps to produce longer lasting blooms, greener leaves and a healthier plant life. It eliminates watering by hand to make it easier for you to get your plants watered. It gives direct watering for up to 10 planters. 1 Pressure Regulator with 1/4" Tubing Adaptor. 25 feet of 1/4" Tubing. 10 1/4" Stakes with Bug Caps. 5 Spot watering emitters 2 GPH. 5 Spot watering emitters 1 GPH. 1 Pressure Regulator with 1/4" Tubing Adaptor. 25 feet of 1/4" Tubing. 10 1/4" Stakes with Bug Caps. 2 1/4" Barbed couplings.